Here is the situation, I know I have a stuck valve in the intake causing code P2070, I've been ignoring it because frankly the car runs tons better with it open. Now more recently after a spirited drive through the north country here (where I averaged a good 20mpg) I had a few extra codes show up; P0410, P2004, and P0171. The P0410 code I believe has been on and off for a while, till the air pump finally popped it's fuse mid last week. The P2004 code I figured was about the same as the P2070 code for that stuck valve (mind you that I don't really plan on unsticking it since the car has been more responsive since it stuck open). So the only code that concerns me is the P0171, Adaptive Fuel Trim Too Lean (Bank 1). I assume, due to the close proximity of that code showing up after the valve stuck open, that the two codes could be related. I have checked for vacuum leaks (including behind the intake manifold) and have not been able to find any. I also took the time to plug off the vac line for the stuck valve thinking maybe it's diaphragm became damaged after it got stuck. Now as far as the cars functioning goes, I've seen numbers as lean as 11.4afr and EGT as high as 1750*F and may have a leak around where the CAT and exhaust manifold bolt up. She still gets 20mpg and pulls like mad from 3500 and on and screams right up to cut off. So I was weary of thinking the fuel pump is going out on her. I also am not registering any miss-fires or knocks. I should also note that she starts with a touch of the key and idles just fine staying right around ~800RPMs. Now the first three would make sense if there was a leak in the vacuum line between the UIM and the vacuum chamber that supplies the VDI, SSV, and AIR solenoids. But the 'APV stuck open' is strange because its not vacuum assisted like the others, it uses a stepper motor. Not to mention you reported that the car drives and idles fine. I'm wondering if its a PCM malfunction generating false CELs. You mentioned that you checked for vacuum leaks behind the intake manifold, but did you inspect the vacuum line for cracks. I'm referring to the line that goes between the UIM and the vacuum chamber. Last edited by Jon316G; 10-20-2009 at 09:35 PM. I did check on the back side of the UIM, and everything seemed fine but I can break out some vacuum testing equipment and look around. What is the vacuum level at idle? 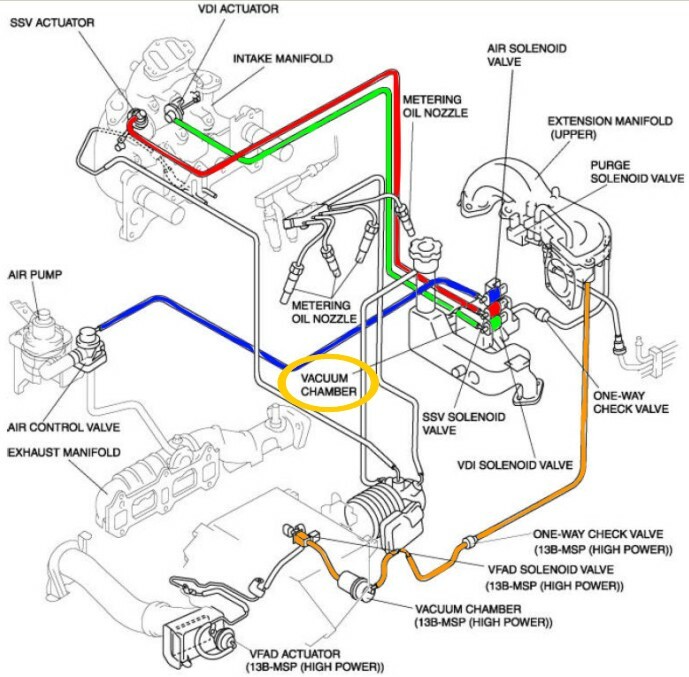 Now the only thing I don't know is what the APV valve is. I did confirm the exhaust leak, there is a nut missing off the flange so i'll have that fixed up in a jiffy. Otherwise I really do feel like some of the codes could be a product of the other issues, which I have seen in the past with a 99 Jeep that I had. Now real quick, where is the vacuum chamber located? I had a miss-hap with the little black vacuum cylinder that is mounted to the intake box a while back and used some krazy glue to repair it. quick extra bit of info, I cleared the PCM of all codes and watched the order in which they appeared prior to the CEL coming on. So I'm thinking that P0171 is a result of the other 2 codes. It'll give you a good visual at where the APV is and how it operates. afr of 11.4 and thats lean? The APV is actuated by a stepper motor, but isn't the trigger for it still vacuum-driven? I don't know the specifics of how the ECU handles the EFI system, but is there a chance the "too lean" code has to do with just the low-RPM time hen the computer thinks the stuck valve should be closed? Seems like the MAF data should trump the stuck valve for the injection programming but if it isn't that could give you a lean mix. Could be the "lean" code is only applicable at idle then the AFR gets more normal running under load. Above 6250 RPM the PCM triggers the motor to open the valves. A positioning sensor is built into the APV motor. Last edited by Jon316G; 10-21-2009 at 09:46 PM. That is what I was thinking since I haven't seen a lean state while the car is running, other then when she leans out to 11.4 under WOT. At idle I see around ~14.5afr down from ~15.0 before I moved the valve from the closed to the open position. Tonight I'll run a couple vacuum tests. As long as I can be sure of the lean code being triggered by the stuck valves and that there isn't a vacuum leak I'll feel fine, since I do like the feel of the SSV held open (and with how stuck mine is in there it won't be easy to get out to clean). As far as the CEL goes, that'll be taken care of by December. On the topic of vacuum leaks, is it possible for ambient pressure changes to affect the appearance/disappearance of leaks? I had some weird performance driving L.A. to Tahoe this summer (virtually no power and a low-pitched engine noise below 4k RPM, almost like it was lugging even at WOT), but it only seemed to happen above 7000 ft altitude and cleared up when I got back down to 6500 at the lake. I would think that normally the vaccum level shouldn't be sensitive to ambient, but I wonder if the air pump in the Renesis being hooked into the vacuum system might make this engine work differently than piston engines which essentially use intake suction.